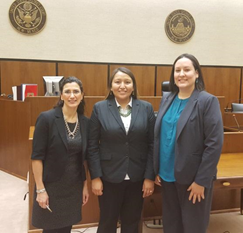 Adjunct Professor Rodina Cave Parnall (l) with Connie Tsosie de Haro (’16) and Christine Jordan (’16), who presented an oral argument at the U.S. Court of Appeals for the Tenth Circuit in Roswell, NM. Throughout the years, hundreds of New Mexico judges and attorneys have provided critique and feedback to UNM Law School students honing their skills in academic competitions. This year, a federal Court of Appeals Judge and an international delegation of high level officials and judges shared their legal expertise with two third year law students. Connie Tsosie de Haro (’16) and Christine Jordan (’16) had practiced their arguments for the National Native American Law Students Association (NALSA) Moot Court Competition more than a dozen times since January. They argued their case to their coaches, Visiting Prof. Kip Bobroff and Adjunct Professor Rodina Cave Parnall a few times, and then Bobroff arranged for them to present to Senior Judge Bobby R. Baldock of the U.S. Court of Appeals for the Tenth Circuit and a delegation of international visiting dignitaries. When they arrived at the Court of Appeals in Roswell, Baldock greeted them graciously and introduced them to his court staff and to the dignitaries. Everyone was kind and encouraging and made the experience a very positive one for the students. Senior Judge Bobby R. Baldock (center) of the U.S. Court of Appeals for the Tenth Circuit with his court staff, the UNM Law team and international delegation of law enforcement officials and judges. Approximately 40 people heard the students’ presentation – the judge, his entire court staff, and the International Law Enforcement Academy (ILEA), comprised of high-level law enforcement officials and judges from Belize, St. Kitts, and St. Vincent. After the arguments, the judges gave specific examples of what each student did well, and what still needed some work. They also offered some helpful tips. After the judges gave their critiques, Baldock opened it up to the delegates to provide feedback and ask questions. “The delegation offered several new ideas that we did not even consider that helped make our arguments stronger,” says Tsosie De Haro.